Mad Market Card Sign Up Now! Fresh Fruit, Vegetables and Meat all in One Place! 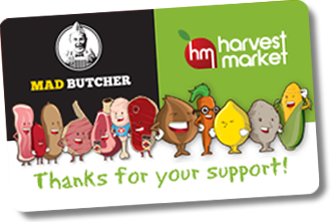 Welcome to the Harvest Market & Mad Butcher combined stores. We are one of the only locally owned, independent green grocers left in Christchurch. We now import a huge range of grocery lines direct from USA and Europe. This means fantastic savings in store on trust brands that save Harvest Market shoppers even more!! You can now say good bye to those outrageous supermarket prices once and for all!! Our Policy - TO SAVE YOU MONEY ON YOUR SHOPPING BILL! We now have 3 buyers continuously on the hunt for great buys that we are passing on to you - our most loyal customer. Our thoughts are that you shouldn't have to wait for any particular day of the week to get a great buy on fresh food. Instant notification of MadMarket Mega Deals! It's completely free to join and will save you $$$$!! © Copyright 2010 Harvest Market. All Rights Reserved.